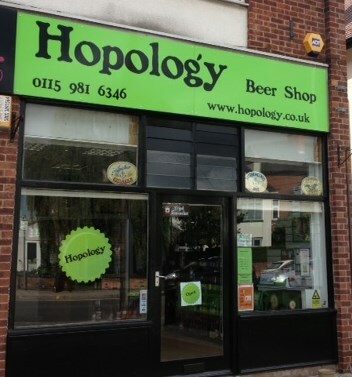 The Hopology Beer shop is on Melton Road in West Bridgford and is a relatively recent addition to the craft beer scene in Nottingham having opened this summer only back in July. I first heard about them when they were featured in the Nottingham Post and I honestly do not know why it has taken me so long to find my way down there to see what they have on offer. 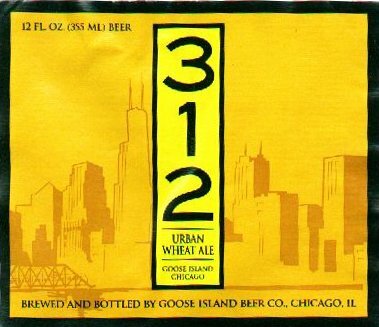 When I had first seen the article I had tweeted with them to see if they had one of my favourite Chicago beers the Goose Island 312 and they did have it. If I had turned up back then in July I would not have had to wait 2 months to have a little drink of that beer. As well as a good selection of beers from Chicago’s Goose Island Brewery, Hopology has a nice set of shelves filled with beers from the USA and they seem to have been able to select not only some really good craft beers but also just like the 312 other beers with some pretty good artwork on the labels. 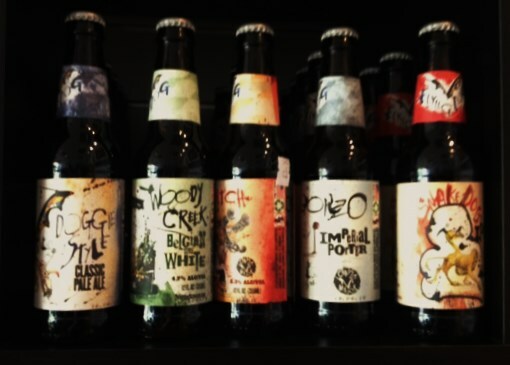 I was instantly drawn to a shelf filled with bottles from the Flying Dog Brewery based out of Maryland. 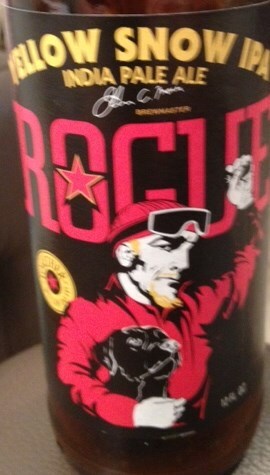 It was tricky choosing the style of beer that I like without getting distracted by the picture on the bottle. 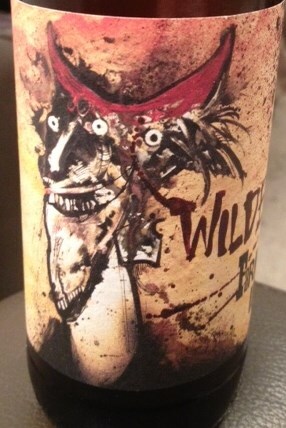 In the end I think I got the best of both worlds with a bottle of Wildeman. 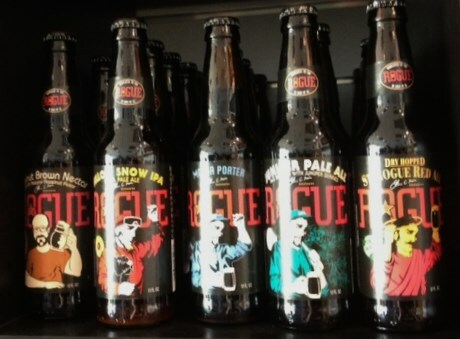 Another shelf that caught my eye was a whole line of bottles from the Rogue Brewery in Oregon. This was another set of bottles with incredibly eye catching artwork. I picked up a bottle of Yellow Snow IPA, an India Pale Ale described on their website as “Pale golden in color with a hoppy fruity aroma. Big hop flavor up front complemented by medium body and hoppyness mid-pallet. Finishes with a characteristic lingering bitterness” This is another great drinking beer, although another one that you probably wont be able to drink too many of as it is pretty strong. Apart from the US beers, there was a pretty good selection of Craft Beers from across the UK and Europe, including a whole load of beers from Brew Dog that I had not seen in bottles before. I usually end up getting bottles of Punk IPA, Dead Pony Club, or 5am Saint all really good beers that you can even get in some UK supermarkets. 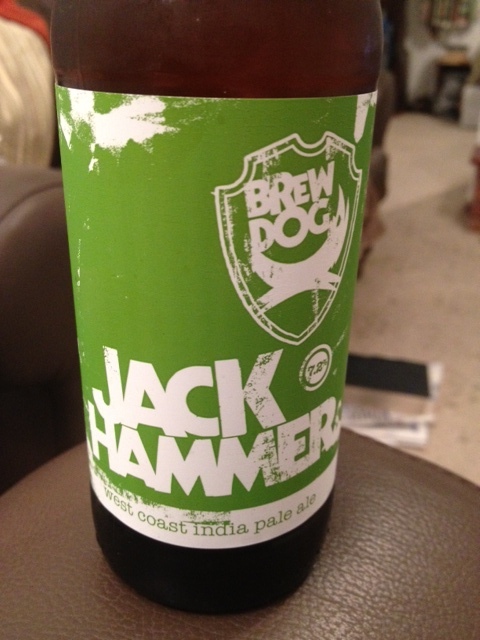 On this visit to Hopology though I purchased a bottle of Jack Hammer a ‘West Coast Indian Pale Ale’ a cheeky little number at 7.2% it has a stealth strength that crept up on my brain as I slowly downed the glassful. 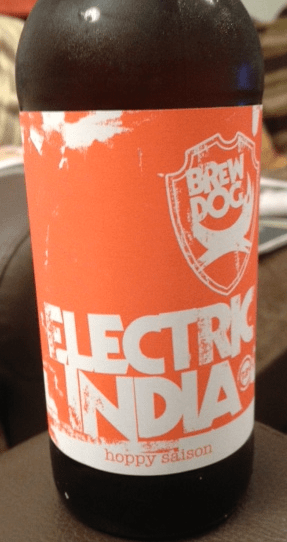 There really is something about the BrewDog beers there is a degree of gloriously uncertainty about them, a slight swerve to the left of beer normality that seems to be so wrong yet so right at the same time. 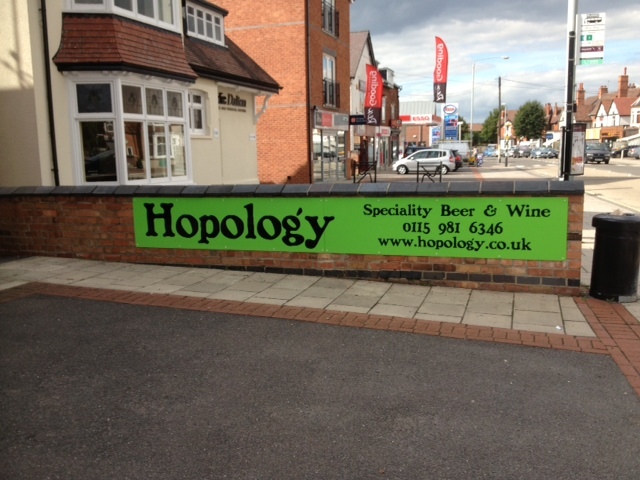 Hopology is a rather fitting home for them to sit awaiting the grasp of the not so average craft beer officianado. I think that Hopology may well have become my new favourite shop for craft beers in Nottingham. It has made us wonder whether to drop the ‘ongoing search’ from the title tagline, perhaps it should be ‘the home of excellence’? I don’t think that I have seen anywhere else to rival them yet? Another added bonus was that the prices were not too bad either, between £2-3 a bottle (well for the ones that I bought above). Not only that but on the other side of the road you can get some excellent food from some of Melton Road finest including Canterburys, Georges, The Tall Frog, and Taste (just to mention some of what is available in this little Gourmet enclave). Hopology is located at 126 Melton Road in West Bridgford and you can check them out on their Facebook page and Follow them on Twitter too. I have just one request, don’t buy all of the 312 leave some for me! Great post, thanks. I found it via google whilst looking for craft beer shops in Nottingham. Saw the blog at 10am, was stood outside the place at 11am waiting for it to open, by 11.20 I was £50 out of pocket, had a good selection of beer under my arm and was a very happy man… I only took one bottle of 312, so plenty left for you.